Prince M. et al. 2015. World Alzheimer Report 2015. The Global Impact of Dementia. An Analysis of Prevalence, Incidence, Cost & Trends; Alzheimer's Disease International: London, UK. Folch J. et al. 2016. Current Research Therapeutic Strategies for Alzheimer's Disease Treatment. Neural Plast. 2016, 8501693. Russell C.L. et al. 2014. 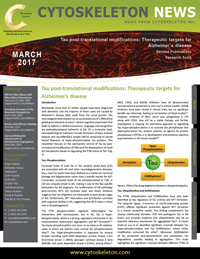 Post-translational modifications in Alzheimer's disease and the potential for new biomarkers. J. Alzheimers Dis. 41, 345-64. Simic G. et al. 2016. Tau protein hyperphosphorylation and aggregation in Alzheimer's disease and other tauopathies, and possible neuroprotective strategies. Biomolecules. 6, 6. Hoover B.R. et al. 2010. Tau mislocalization to dendritic spines mediates synaptic dysfunction independently of neurodegeneration. Neuron. 68, 1067-81. Hanger D.P. et al. 2009. Tau phosphorylation: the therapeutic challenge for neurodegenerative disease. Trends Mol. Med. 15, 112-119. Lovestone S. et al. 2015. A phase II trial of tideglusib in Alzheimer's disease. J. Alzheimers Dis. 45, 75-88. Zhang Y. et al. 2014. Silencing [Formula: see text] Rescues Tau Pathologies and Memory Deficits through Rescuing PP2A and Inhibiting GSK-3beta Signaling in Human Tau Transgenic Mice. Front. Aging Neurosci. 6, 123.
van Eersel J. et al. 2010. Sodium selenate mitigates tau pathology, neurodegeneration, and functional deficits in Alzheimer's disease models. Proc. Natl. Acad. Sci. USA. 107, 13888-93. Sahara N. et al. 2005. In vivo evidence of CHIP up-regulation attenuating tau aggregation. J. Neurochem. 94, 1254-1263. Luo H.B. et al. 2014. SUMOylation at K340 inhibits tau degradation through deregulating its phosphorylation and ubiquitination. Proc. Natl. Acad. Sci. USA. 111, 16586-16591. Liu F. et al. 2004. O-GlcNAcylation regulates phosphorylation of tau: a mechanism involved in Alzheimer's disease. Proc. Natl. Acad. Sci. USA. 101, 10804-10809. Lefebvre T. et al. 2003. Evidence of a balance between phosphorylation and O-GlcNAc glycosylation of Tau proteins--a role in nuclear localization. Biochim. Biophys. Acta. 1619, 167-76. Min S.W. et al. 2010. Acetylation of tau inhibits its degradation and contributes to tauopathy. Neuron. 67, 953-966. Cohen T.J. et al. 2011. The acetylation of tau inhibits its function and promotes pathological tau aggregation. Nat. Commun. 2, 252. Min S.W. et al. 2015. Critical role of acetylation in tau-mediated neurodegeneration and cognitive deficits. Nat. Med. 21, 1154-1162. Liddy K.A. et al. 2013. Functional decorations: post-translational modifications and heart disease delineated by targeted proteomics. Genome Med. 5, 20. Kim M.Y. et al. 2012. Role of transcription factor modifications in the pathogenesis of insulin resistance. Exp. Diabetes Res. 2012, 716425. Margolin D.H. et al. 2013. Ataxia, dementia, and hypogonadotropism caused by disordered ubiquitination. N. Engl. J. Med. 368, 1992-2003. Sullivan I. & Planchard D. 2016. Next-generation EGFR tyrosine kinase inhibitors for treating EGFR-mutant lung cancer beyond first line. Front. Med. (Lausanne). 3, 76.